RuneFest has come and gone but this year there's a difference, I was there. We've discussed RuneFest extensively on the podcast both immediately after on episode 692 - RuneFest 2018 and last week on 693 - And One More Thing... where we gave a rundown and recap of the festivities. This time I want to discuss the RuneScape community. There is no better word to describe RuneFest than "community". Cireon will be chatting with you soon about the effect RuneFest can have on meeting your dear online friends in real life. At RuneFest there is only one RuneScape community. RuneScape has always been subject to different communities and chasms between them. Today it's RuneScape 3 or Old School RuneScape. On the Friday night all attendees were invited to "RuneScape Live: Gielinor in Harmony." 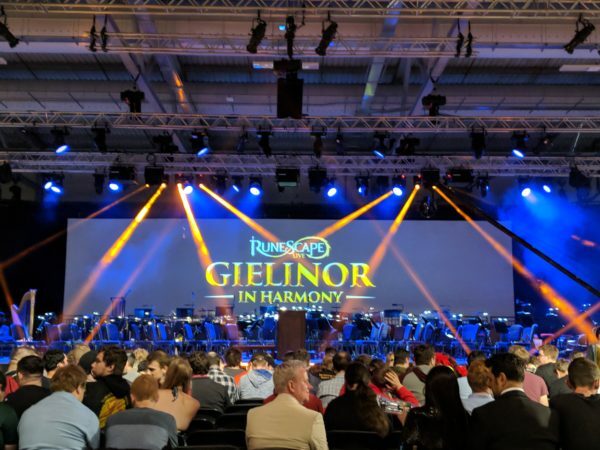 The main feature was a performance by the Royal Philharmonic Orchestra where an arrangement of RuneScape music was played. The performance told the story of two RuneScapers aiming to complete a quest! The two RuneScapers were able to get on and progress for a while through the quest but inevitably they needed to team up. We saw a merged game world as well as both the RuneScape 3 player and Old School player adapt to aspects of the other's game. For someone such as myself who has witnessed the strife between both communities online this was really touching. It makes me wish for a day where we can once again both enjoy the same game of RuneScape. Could one of the future game updates or a new game entirely bring the player base together? We'll see. This general theme continued on to the next day. The food kiosks were set up in the wilderness (as you progressed further into the venue, you ventured more north) and many gathered in this area throughout the day for lunch. After acquiring lunch, Cireon and I found a seat, we were seated across the table from a couple. Upon sitting down one of the first questions were were asked, Old School or RS3? They jokingly said we couldn't sit down as we were RS3 players but that was that, a joke. We chatted a bit and ate our lunch in peace. Players of two different games, seated at the same table in peace. One RuneScape community. Not a week goes by without some Jagex Moderator being down talked to online. There's the old adage that it's a lot easier to say something online to someone than in person, this combined with the RuneFest atmosphere that could only be described as positive means that everyone is on their best behaviour. Talk to any JMod and you'll be greeted with an immense helping of passion. We had illuminating talks with Mods Raven and Jack. As well as a couple from the art team and business development side too. If the online keyboard warriors had been to RuneFest or even had the slightest inkling of how much each and every JMod cares, the RuneScape community would be a lot more civil online. RSBANDBUpdate! has covered practically every major game shifting update, we do it to the best of our abilities, but at the end of the day there are humans on the other end who make the product. We are mindful of that and have been mindful of that and will be ever more mindful. Next time you're angry at an update, remember that these people are creators, artists, programmers, and designers. They create something out of nothing, that's big. This is not to say that we should go easy on Jagex or give the game designers and developers a free pass. One of the most difficult things with producing RSBANDBUpdate! is measuring the placement of the community and Jagex and then reconciling the two. Whenever an update comes out one of the first questions I ask (aside from, how good is this?) is who needs to be led and where? Visiting with the creators and designers at RuneFest brings an invaluable insight to this process. I feel that RSBANDBUpdate! and the RSBANDB network already had an appropriate level of tact but a trip to RuneFest could prove invaluable for the larger RuneScape community. RuneFest in a way is a lot like Christmas. It's the one time of year where people can come together, celebrate each other, and celebrate the fantastic game of RuneScape. 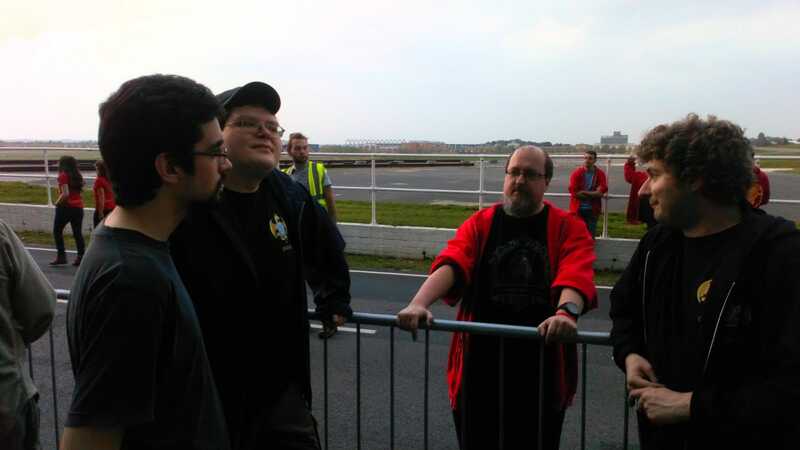 Under the roof of the Farnborough International Exhibition and Conference Centre where RuneFest was taking place, there was one RuneScape community. One RuneScape community talking about RuneScape 3, Old School, Skills, Combat, Lore, and more with friends, fellow players, community creators, and Jagex Moderators. That is what RuneFest is about.